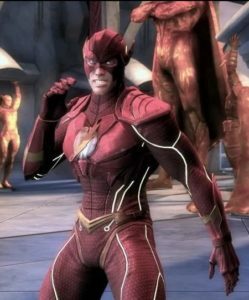 This page contains a character guide for The Flash in Injustice 2. Here you’ll find movelists, combos, juggles and strategy guides and recommended gear for the Hero character. For more Injustice 2 content, head over to our Injustice 2 top page. After an electrical accident at his lab, scientist Barry Allen was left with the ability to move, think and react at super speeds. A member of the Justice League, the Flash uses his super speed to fight crime. Below are combo and juggle inputs for The Flash , including corner strategies and restarts. Flash wears a full-body red costume with yellow accents. He has small yellow lightning bolts around his wrist and a lightning bolt logo on his chest. He also has two lightning bolts facing outward from his mask. The One Earth Regime’s version of the Flash has a similar costume to his main counterpart. However, the costume incorporates more armor and more prominent wings on his head. He retains his small lightning bolts on his wrists but also has them on his waist. He also retains his lightning bolt logo but has less yellow accents. He wears this costume as a member of the Regime. 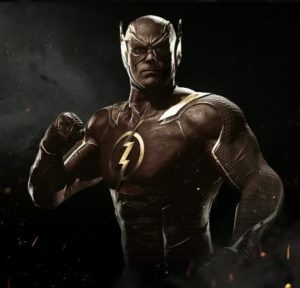 The Flash was also playable in NetherRealm’s crossover game, Mortal Kombat vs. DC Universe. The Flash is voiced by Neal McDonough, who previously voiced Green Arrow in the DC: Showcase short of the same name. The Flash is the only member of the Regime whom sided with the Insurgency.